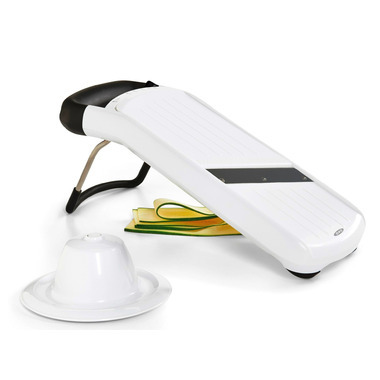 OXO Good Grips Simple Mandoline is made of stainless steel and plastic. Features 3 thickness settings: 1/16" (1.8mm), 1/8" (3.2mm), 1/4" (6.4mm). Angled blades slice through the most delicate fruits like tomatoes. Legs fold and blades lock in closed position for compact and safe storage. The spring loaded food holder advances food automatically during slicing and indicates when food is completely sliced with minimal waste. The comfortable grip also keep fingers away from the blade.